Can You Get Invisalign in Tulsa On the Top or Bottom Teeth Only? Most of us take our bite for granted, but the way our teeth come together is actually quite complicated! Not only can you easily detect any changes in your bite down to a fraction of a millimeter, but those changes can actually damage your teeth and jaws if they aren’t done properly. That’s why orthodontic treatment, whether it’s braces or Invisalign in Tulsa, must be done with both function and appearance in mind. 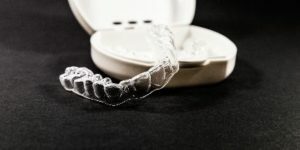 If you’re interested in straightening your teeth with Invisalign, you might be wondering if you can have it done on only your top or bottom teeth. Find out what type of patients that can work for and also learn about the many advantages of Invisalign in this blog! Invisalign has been used for around 20 years to give patients outstanding orthodontic results – without the inconvenience of braces. Appearance – Clearly (no pun intended), the most obvious benefit of Invisalign is that no one will ever know you’re in treatment! Comfort – The smooth, plastic trays you wear are far more comfortable than brackets and wires. Hygiene – Since you simply remove your trays prior to brushing and flossing, you can still do a great job cleaning your teeth. That means you’ll be much less likely to have cavities or gum problems when you’re done! Diet – In braces, you have to restrict your diet and avoid hard or crunchy foods. For the most part, you can eat what you did before in Invisalign because you remove your trays prior to meals. Time – The average treatment time for Invisalign is significantly less than it is for braces, which is a big plus for many patients. Can Invisalign Be Used On the Top or Bottom Teeth Only? In most cases, Invisalign works best when it’s uses simultaneously on both the top and bottom arches. That’s because moving the teeth in one arch will automatically affect the teeth in the other arch. It’s like the moving parts of a machine: They’re designed to work together, so if you change one, you change the other. If you only have very mild crowding or bite issues. If you previously had orthodontics but experienced a “relapse” of shifted teeth. Each patient is evaluated on a case-by-case basis, so the best way to determine if you can have treatment on just one arch is to schedule a consultation with a dentist in Tulsa who offers Invisalign! As a general and cosmetic dentist in Tulsa, Dr. Angie Nauman has used Invisalign to give many of her patients fantastic results. She always carefully evaluates every case to recommend the best treatment plan, so that her patient’s smiles not only look great, but also feel great. If you have any questions, she can be reached via her website or at (918) 254-8686. Comments Off on Can You Get Invisalign in Tulsa On the Top or Bottom Teeth Only?